An exquisite blend of memoir and nature writing, River House is the story of a young woman returning home to her family's ranch and building a log house with the help of her father. An avid river rafter, Sarahlee Lawrence grew up in remote central Oregon and, by the age of twenty-one, had rafted some of the most dangerous rivers of the world as an accomplished river guide. But living her dream led her back to the place she least expected--her dusty beginnings and her family's home. River House is a beautiful story about a daughter's return and her relationship with her father, whom she enlists to help brave the cold winter and build a log house by hand. Together, they work through the harsh winter, father helping daughter every step of the way. Sarahlee Lawrence was born and raised on her family ranch in Terrebonne, Oregon. After a decade of study and travel, and an MS in environmental science and writing from the University of Montana, she returned to the ranch where she owns and operates an organic vegetable farm. "Lawrence writes with remarkable candor about her loved ones; the joys and pitfalls of life in a small community; and the creeping development from upscale Bend 40 miles away. She is in her element writing about nature, and it's a treat to share her journey." "A memoir narrative that pivots off the worlds of landscape and wild water." "It's a sturdy, honest, and direct recounting of the author's audacious life in unusual places, and is a beautifully clear exposition of her relationships with her parents, neighbors, and friends, living and dead." "Lawrence’s voice, like the desert, is beautiful in its simplicity, while she herself embodies the strong womanhood of the American West. Like her many skills, this debut book is versatileresembling, at intervals, a memoir, nature-adventure writing and easily digestible rural philosophy. Her simple prose makes her adventures in construction, gardening and horse-tending seem as thrilling as Tambopata’s rapids. Lawrence’s writing is honest and, like the river that begins her memoir, raw." "More action and grit than soul-searching and pretty writing, this memoir ends up a love note to Central Oregon." "Lawrence’s debut book forecasts the beginning of a new career  that of a talented writer. Her descriptive prose paints a vivid and respectful portrait of the natural world, which she clearly treasures. 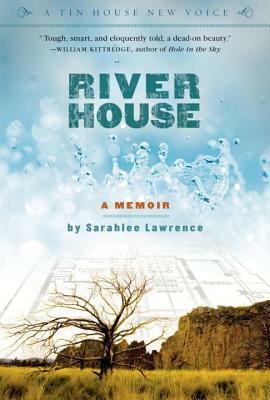 . . River House is a rare accomplishment with a narrative that flows and ebbs like the mighty current of life." "[Sarahlee Lawrence] has crafted a memoir with sentences that draw one’s attention like a firefly buzzing around your head in the heat of summer." "River House is about rediscovering family and working through the compromises involved in finding your life, the people and days you actually love. It’s tough, smart and eloquently told, a dead on beauty. Enjoy. I surely did."